Welcome to the forum, Stourme! Nice anecdote, thanks for sharing. Hydroponics is becoming one of the major commercial farming in India. As the hydroponics plants can control their pH level, plants can be grown in all climatic conditions throughout the year. Tilapia and catfish are the most common fish that are used for aquaponics. Mainly because they tolerate crowding and can survive even in water of poor quality. It would be hard to get enough nutrients from small fish like minnows. Not to mention, they would probably end up in your pump. Hydroponics is getting popular almost in all parts of the world. In India hydroponics can be considered as the most necessary and primary step which is taken in proper time in the field of agriculture. Though organic foods are good for health and natural, the process is so long and also it has done only in a few places. Hydroponics is getting popular among the people and common fruits are vegetables are the most cultivated hydroponics plants in India. Hydroponic system design can be seen in all future farming centers as they practice all type of hydroponics there. As soil is unnecessary for this method of agriculture one can do it easily in any place which he likes and the farmers don't need to worry about infertility, more amount of water, infections by pests and many other problems faced by them in the ancient and normal method of agriculture. 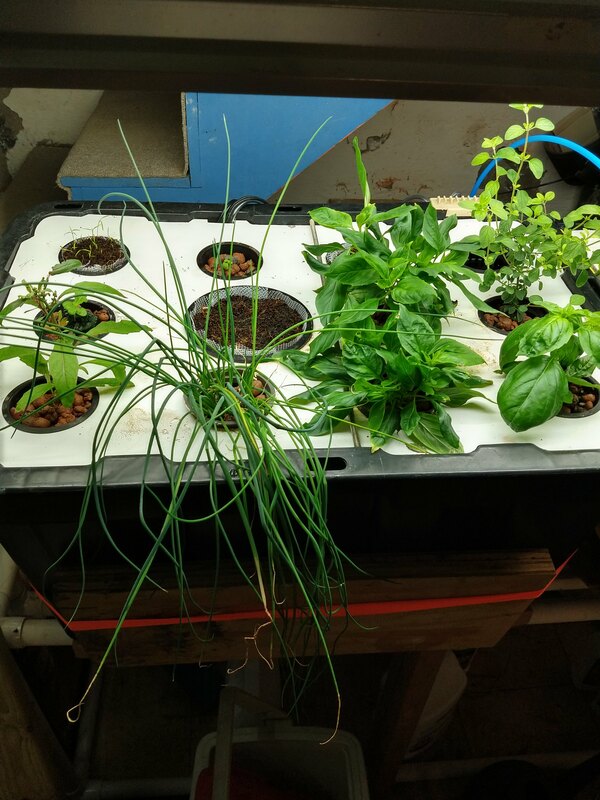 The hydroponics equipment needed for hydroponics cultivation can be taken from the reused household products like old trays, glass jars, pipes, and tube, etc. In case of large-scale cultivation, the equipment can be purchased from the nearby hydroponics training centers and also through online. Pests are still a problem with hydroponics. It is actually made worse by the close planting of monoculture. It is very difficult to get rid of pests once you have an infection and that is usually why most commercial hydroponics are in greenhouses, so they can control the environment. They do not want water infiltration into the system from rain and they need to try to keep pests out. The same greenhouse that isolates the plants, also keeps out good bugs and is really not a balanced ecosystem. If a system becomes infested, usually the only practical way to take care of it is to start over, scrub everything down top to bottom and make sure you have eliminated the pests before you start over. Water quality will also be something you need to think about. You need to use water filters or a custom formula especially if your water is highly chlorinated. Pest control in greenhouses is still important. You need to monitor with sticky traps, get rid of any sick and infested plants and maybe even spray. Good info imafan. As a beginner I’m trying to learn as much as I can. Thanks for writing. Learn all you can and start small. Hydroponics have a high start up cost. You will have to customize the mix for each type of plant. Pumps are expensive and you have to treat the tanks like swimming pools and you should invest in an EC meter to test the water daily. Controllers are used for large commercial systems but home systems will need some of the nutrient powders and a scale to measure out the amounts you need. Systems can be raft, rail, biofilter, or dutch bucket systems depending on what you are growing. Each different type of plant will have different nutrient requirements. Tomatoes require different nutrients depending on their stage of growth. Even if you wanted to venture into aquaculture, you would still need to have a lot of fish and fish food, Fish effluent will not always provide all the nutrients you need so you will still need to supplement. Aquaculture also needs to balance the needs of the fish with the needs of the plants. Water in aquaculture systems do need to be changed more often otherwise it becomes very unhealthy for the fish. A lot of nitrates in the water will mean there will be a lot of algae growth and fish get fin rot and other diseases that have to be treated. The simplest way to start in hydroponics would be with a Kratky system. It has the least up front costs and is a good way to get your feet wet. You can use tubs, stock tanks, or build your own raft system with wood, a waterproof pond liner and styrofoam sheets, An aerator works fine so you don't need an expensive pump and the system needs the least monitoring once it is set up. It is best suited for short crops like lettuce. I have been growing in hydroponics for about a dozen years, but only in the off season, so I can have basil and Thai basil - two herbs I can't be without! through the years I have tried many other herbs, as well as greens, so I don't grow any flowering plants, which makes it easier - only vegetative growth nutrients needed. I only grow deepwater systems - quick, cheap, and easy to get started (I had many of the things from my aquariums) , and to take apart, as well, when I start growing outside again. The herbs and greens also don't need nearly as much light, as things such as peppers. As imafan26 noted, pests can be a major problems indoors. Aphids and spider mites are the two I have to watch for. Fortunately, many of my favorite plants, do not get them, unless it's "runoff" from a plant that is prone to them. I have found some plants that I can't grow indoors, as one of these insects will appear out of nowhere, even if none had been seen for months! For me, spearmint is an aphid magnet, though the aphids only show up on the stems, not the leaves, and the plant still grows like it's on steroids! Eventually I removed them (tried them 3 different years), and the aphids would disappear, and not show up on the other plants again. Yet peppermint grows fine, with no aphids! Rao Ram, Green Epazote, Ngo Om, and sage are a few I can think of that are spider mite magnets, with them showing up, no matter what precautions I took, and as soon as the plants were removed, no spider mites anywhere! Yet, red Epazote does not attract them - I have some growing now. I have a new plant this year - Syrian (a.k.a. thyme scented) oregano, which I am watching closely, but, so far, no bugs. Here is the 22 gal tub, which I set up first, about a month ago. It has the chives, red epazote, Thai basil, Syrian oregano, and Serrata basil - the best basil I have found for this, as it is short and bushy, with a fantastic flavor, and no bolting, as long as I keep cutting it back. I just planted some dill, and garlic chives - dill was up in less than two days, but still no chives. I have used 3 different vegetative nutrient solutions through the years - all seem to work fine. I have an airstone, plus a powerhead with a sponge attached (from my aquariums), and this one with a very low wattage heater, which keeps it at around 70-75º, which is fine for the herbs and greens. Here is the 12 gal tub, which I set up yesterday, and put in some seeds for a baby bok choy variety, two lettuce types, and some Mizuna, in the larger, central pot. Here's a photo showing some of last year's greens; you cut them back, and they just keep growing! Thanks for those replies. I’m taking as many notes as I can. Is that a styrofoam top? Also, what kind of system is that in the photos and what do you light that with? That looks really healthy. People here have also converted their large ponds and use it for aquaculture. It looks like a Kratky set up. If you have large plants you will not be able to use all of the net cup space, unless you have spaced them correctly, since the plants would be too crowded. Plant spacing for the hydro systems would be the same as in the ground unless you are harvesting them earlier. 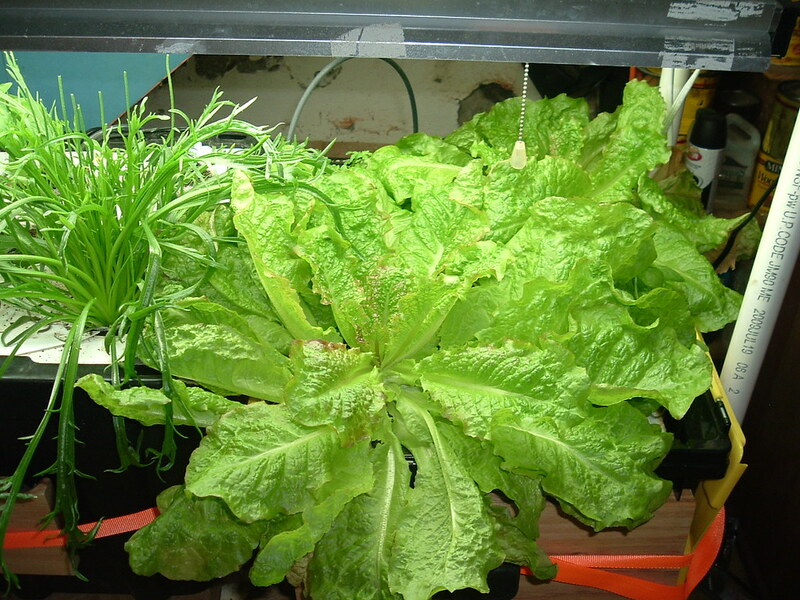 Vegetative crops are the best for indoor hydroponics. They do have the simplest mixes and do well under artificial light. Raft systems allow you to grow different crops (as long as they have the same requirements). If your tray is static like in a Kratky system, then it is more important not to mix plants that have different growth rates. The faster, hungrier crops will lower the water faster and starve the slower crop. This happens when you put swiss chard or cabbages with lettuce. The larger crop root system is more expansive and the lettuce is smaller since its' shorter root system has to reach farther to get into the nutrient solution as it is taken up or evaporates. dobro13 wrote: Thanks for those replies. I’m taking as many notes as I can. Is that a styrofoam top? Also, what kind of system is that in the photos and what do you light that with? That looks really healthy. The small tub has a styrofoam raft, but the large tub has a piece of plastic, sitting on a ridge in the tub, so it doesn't move. I have to watch the water level in that, esp. in the beginning, but eventually, the roots get so large that even if the level goes down 3 or inches, there is no problem. Still, I try to keep them topped off, as well as I can. These are both deepwater culture systems (DWC). Having kept aquarium fish for more than 50 years, I have a LOT of the equipment needed - a bunch of air pumps and powerheads, many of which friends have given me when they'd move, or get tired of taking care of them! I couldn't imagine using the Kratky system, letting the water stagnate; knowing what it would do to fish, and what it would smell like (! ), I decided to use the DWC system. I just put one airstone in each tub, and a powerhead, with a foam filter on it. This becomes a bilogical filter, eventually, digesting any of the dead pieces of roots and the like, and keeps the tub clean. I rarely change any of the water, as is often recommended (something started by sellers of the nutrients, IMO), and when I change some, I just siphon out a gal from the small one, and 2 from the large, and use that to water plants in pots. That head of leaf lettuce in the lower picture is sort of overgrown - that was because it was about the time I was starting to get it from outside, and I had pulled the bok choy that it would have been covering in the hole to the left! All of these things that I grow are "cut and come again" types, and as long as I keep cutting, they keep growing back! 2 lettuce, 2 bok choy, and one of many of the herbs are all that is needed for me. I often have to trim the basils even if I'm not using it, just to keep them from bolting, as well as to keep it from covering plants next to it. Yet every time I need a large amount of it, as many Asian recipes call for, one plant is more than enough. I am trying another lettuce variety this time, along with that unknown one I save seeds from (a type that I got in a mix one time, that produced way longer than any other variety I ever grew, before bolting. If I knew what it was, I'd just buy the seeds! lol And the mizuna I haven grown in the hydro before, but it should be good. I might get some of the red next time, if this seems too large, as that is much smaller. I can't post photos any longer from there, but guests can view them...I think. Look at the albums for hydroponics - there's one showing the cloning I do in the hydroponics, as well. Update - I forgot to mention the lighting. I have two 4 foot T-8 bulbs, 5,000k, in a fixture down the middle, and two T-5 bulbs, 6,500k, one on each side. Seems to be plenty of light for these types of plants.